Can you configure replication agents the same way? Would be cool to have a single package with all agents for envs. Unfortunately you can not but it will be a good enhancement request. Please create enhancement request in daycare. So all the documentation is around OSGiConfig, but if you edit the configurations in Felix, it generates a new nt:file, leaving the old OSGiConfig the way it was, so wouldn't the proper formate be a nt:file? Hi Yogesh,Can u pls share code base for this? Hello example code if already there in post, Let me know if you want any specific code. As package can u pls upload it. I am very sorry but do not have any specific package for this. But it should be very easy to implement this. Please let me know if you are getting any error while implementing this ? I could see values stored under /apps/system/config/com......How I can access those array of values.Currently it is stored as binary data. If I have two sites in one CQ5 instance, for e.g en, en_US. How will I be able to configure different values for same property for both sites ? If it is static content then you can can use i18n feature http://www.wemblog.com/2011/12/how-to-use-multi-language-translation.html one with jcr:language=en and other with en_US. If it is read from dialog then in that case you have to implement some thing at code level. 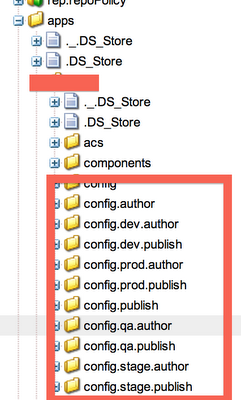 CQ ConfigAdmin picks a folder based on the runmode like your example config.author.dev. I have a usecase where-in my custom service is supposed to use two different set of properties based on whether its day or night. I know we could have an if else in service itslef and taking a superset of all the parameters, so wondering if runmode can help me here. 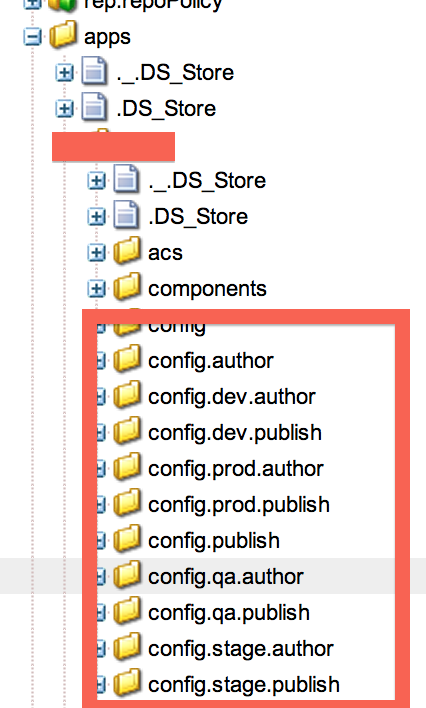 Like if I create two different folders say config.author.dev.day & config.author.dev.night and then creating under each of it osgi:config node same as PID of my service. This will make it more flexible but have not found a way to do the same so far. Can you help? Run mode can not help in this case. As Run mode are set during startup. You need to use if then condition for this to work and then use ConfigUtil service to read from different configurations. Is it possible to display a more user-friendly name in Felix console for the config factory instance instead of the PID? Our customer would like to create multiple factory instances of the same service and be able to easily distinguish between all of the instances with a more user-friendly name. for config factory you can use friendly name after pid .. some thing like com.mycompany.something-myfriendlyname1 com.mycompany.something-myfriendlyname2 so on. Hi, for the Configuration of Factory items, how do those get registered with the Facade class? facade class is just a helper in case you want to get particular service within factory service based on key. I was trying to create a property on a Service using the option#2, code way. I am seeing a strange behavior. The service will be "unbound" until it is SAVED at least once. When I tried to find on the net, I found a similar thread but can't make out what was the solution. (https://forums.adobe.com/thread/1088425). Can you create a corresponding osgi config in repository as well to test ? for example in your case you have to create com.cq.querybuilder.BaseConfig.xml under some /apps/config node and then set up property there. I'm trying to create a Configuration factory. Anyway I can't understand how you can make it works. In particular I get stuck with the bind method. I get a compile-time error with your code due to the incompability of the ServiceReference object with the MyCustomService class of the map. If I try to do a cast before to put the object into the Map I get a CastException. 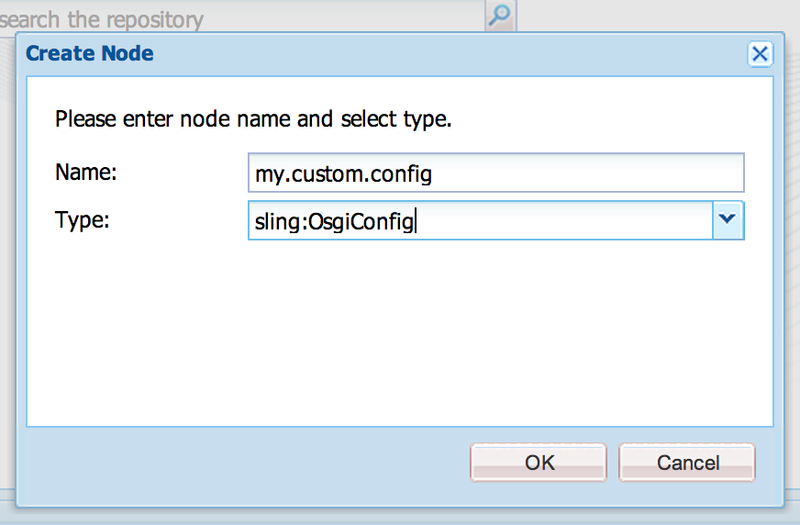 I created configurations by creating node sling:OsgiConfig. 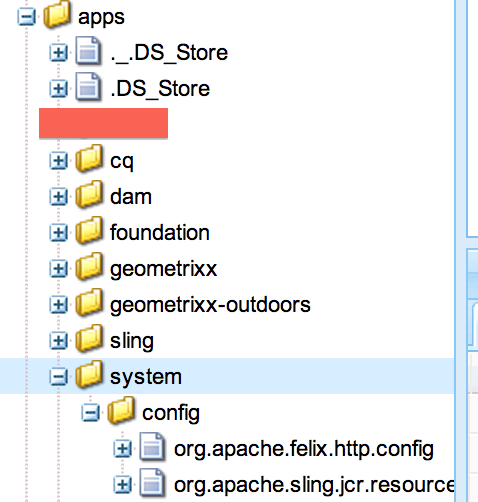 I have a property which is likely to change often, which I need to configure through felix console. How do I do that? 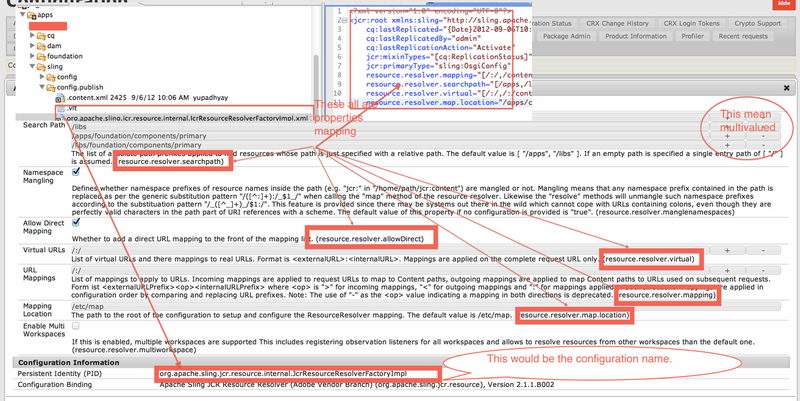 Or is it not a good idea to keep these kind of properties in OsgiConfig node? If these property can be changed by author or admin on regular basis and not during code deployment then I would suggest not to use osgi:config approach at all. Use some kind custom property that user can change through UI and then read it through code. Thanks for the response. Is it a best way to provide this as property that can be configured through Felix console? So, I have osgi:config node for the class for those parameters that will not change and as well as have the @Property configuration parameters in the class which can be managed through Felix console. I think your approach of defining changeable property through @Property should work. 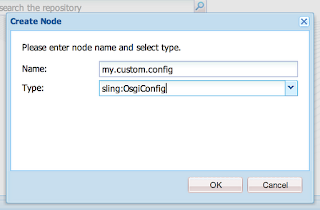 Is it possible to override the factory configuration PID from crxde using sling:osgiconfig type. 6ad86ce9-752b-410d-8ada-23a06111e369 is appended bt cq. But when i want to made its osgi.config from crxde it is giving me an error. "Could not save changes. Received 403 (Forbidden) for saving changes in workspace crx.default. Failed to resolve path com.xperian.cms.base.swse.services.xperianswseconfiguration.6ad86ce9-752b-410d-8ada-23a06111e369 relative to node /apps/xperian/configuration/config.author"
Is there any way to override this values ? or we have to create the new one ? They all should work. I would suggest to use felix console for randomly generated PID. 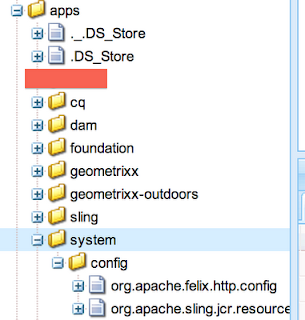 I have tried with net.cms.aem.search.sql2.core.facets.QueryFacetConfigurationFactory.Full-text-search.xml as well.